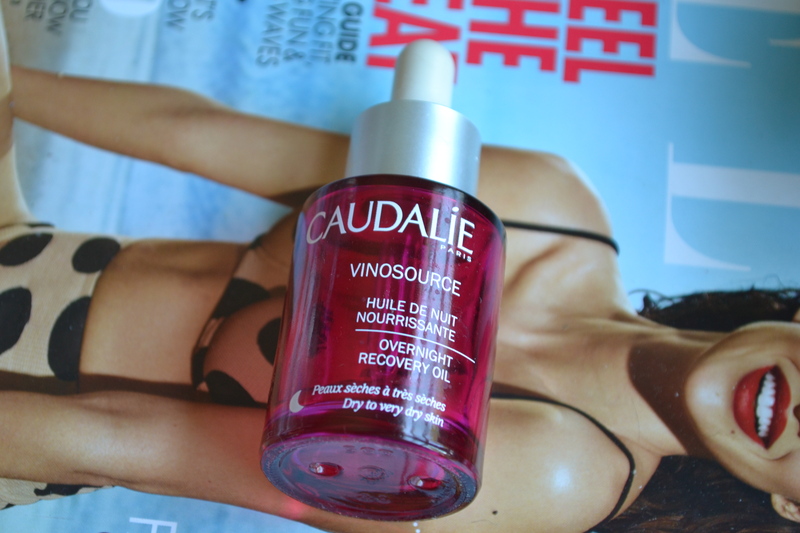 Ever since I was given the Caudalie Vinosource Overnight Recovery Oil ($55) for Christmas last year, I’ve been happily applying it underneath my moisturizer in the serum stage, both evening and morning. The oil might be pricy but it does what it says, working impressively to soothe and restore dry sensitive skin overnight and only requiring a few drops to do so. In the six months that I’ve been using this oil consistently for six months and have noticed that it has definitely helped to soothe and nourish my sensitive skin, deal with dry patches like a champ and adds radiance. Caudalie describes the oil in more detail as being “formulated with a blend of six 100% natural plant and essential oils” and claims that the dry oil “deeply nourishes, soothes sensitive skin prone to redness or irritation, and repairs the skin’s barrier”. Caudalie also claims that “upon awakening, the skin regains a soft, supple texture that feels transformed, fresh and radiant”; while these claims do sound a bit exaggerated (as the claims of skincare do have a tendency to be), I actually do believe that this oil has helped to do what it has promised. My only hesitation is the amount of essential oil contained in the blend, as while the rose smells lovely, it does have the potential for even greater irritation than regular fragrance – but I haven’t noticed any of this come into play, even on my rather reactive skin. And it is worth noting that the rose essential oil is towards the bottom of the ingredient list, so it’s less problematic than if it were the first ingredient. Also, oil blends such as this one tend to be worth investing in because they provide the benefits of all of the different oils rather than a singular one. Ingredients: Caprylic/Capric Triglyceride, Vitis Vinifera (Grape) Seed Oil, Simmondsia Chinensis (Jojoba) Seed Oil, Sesamum Indicum (Sesame) Seed Oil, Cymbopogon Martini Oil, Helianthus Annuus (Sunflower) Seed Oil, Rosa Damascena Flower Oil, Rosmarinus Officinalis (Rosemary) Leaf Extract, Geraniol, Citronellol, Linalool, Citral, Farnesol, Eugenol, Limonene. The bottle is a nice, standard 1 ounce opaque glass with a sturdy dropper applicator and is rather pretty in an unassuming way and is efficient. The texture is surprisingly hydrating for a dry oil but it behaves as one, feeling lightweight and quickly absorbing into the skin and leaving a glow without a hint of oily residue and I do appreciate that a little goes a long way. I would recommend this oil to anyone willing to shell out the price tag who is looking for a soothing oil to try and does not have an issue with rose essential oil. For combination skin types or those that are not consistently dehydrated, this oil might only be ideal for nighttime but on my dehydrated and just plain dry skin, it’s a godsend even in the mornings. I would definitely consider repurchasing it in the future after I finish this bottle but at the moment I’ve purchased a more affordable single note organic rosehip oil to use after I run out of this beauty. Have you tried any facial oils? I love facial oils! I’ve used Kiehl’s Midnight Recovery Oil in the past, which was just ok (I loved the smell though). Right now I’m using the Clarins Lotus oil which I love! Again, it smells amazing, and I find that it helps calm / sooth my skin when it’s irritated or acting up due to allergies. I only use facial oils at night and my skin feels supple in the mornings! I’ll have to go check out the Caudalie one – I did not know they made a facial oil – I’ve liked most of Caudalie’s skincare that I’ve tried. This oil is kind of amazing – and I do believe that Caudalie makes two different oils… I’m right with you on the Kiehl’s and I definitely do share your oil sentiments (unsurprisingly, because we seem to have similar thoughts and preferences on the skincare front). I’ll have to keep an eye out for the Clarins one – it sounds great! Yes I have tried facial oils like Josie Maran and one from Borghese, I am not sold on those two because the lack of smell. I really love Caudalie products because of their smell. I could see that – Caudalie products do smell awfully good! That sounds nice! I’ve tried the tarte, josie maran and the boscia ones. I think oils are nice for a little while but I still prefer the consistency of lotions. Oils are definitely not for everyone all the time – and I’ll make sure to give your blog a read!